There's an editorial in the Greenwich Time from Thursday called "Ban the possession of wild animals." It's obviously about last week's chimp attack. I totally agree with this line: Keeping a wild animal poses a threat to neighbors, none of whom signed up to share a street with one, and -- as this case showed -- police, who would be the ones called when something goes wrong. 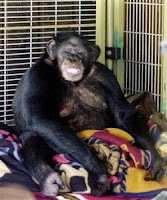 There are many terrible aspects to the chimp situation- I most think about the injured woman, the dead chimp, and his owner who must be devastated- but it's maybe more important to think about the other people who could have been hurt by the chimp who weren't even given the option of avoiding him. The chimp's owner was keeping him in a residential area- an area where children play. When Travis got loose last week, and probably on other days, he could have hurt someone who did not even realize he lived nearby. I heard from a North Stamford parent who had been playing outside with his kids when he saw the cop cars; he'd had no idea a chimp was living a few streets over. That's just scary. Not only was Travis a wild animal, not made for domestic life, he was huge. At least a dog that gets loose will weigh less than Travis' 200 pounds; a parent would have a chance in pulling it off their child. It's insane that the state let someone keep a large animal that's known to be violent when it hits puberty. I, like many people I know, am trying not to think about the chimp thing too much- it's overall a very sad situation. I think all we can do is move on and try not to let this happen again; banning exotic pets is a basic step in that. No one in a residential area should own a chimp, a poisonous snake, or any animal that can hurt a person. And I just have to say, poor Travis. I obviously feel worse for the people involved, but when I look at pictures of the chimp, I feel bad he met such a violent end. He was living in an environment for which he simply was not intended. He was a wild animal, not of a species like dogs or cats whose aggression has been bred out for thousands of years. From what I read, his aggressive behavior was pretty normal for a chimp. I hope people will learn from this and stop keeping animals that are not made to be pets. Like the Greenwich Time editorial suggests, go to the shelter and get a dog or cat if you want to nurture something. If you're looking for an unusual thrill... go skydiving. Don't get a monkey, or a prairie dog, or an alligator; they probably do not want to be with you, and it's not fair to do that to them. Connecticut officials said 11 permits have been issued since 2005 to state residents to own non-domestic animals, and none have been requested or issued to own a primate. But neither the state nor municipal animal control officers know how primates may be illegally owned statewide along with pets such as crocodiles, poisonous snakes and other exotic animals, said Edward Parker, chief of the state Department of Environmental Protection's natural resources bureau. Nine of the state permits since 2005 went to licensed wildlife rehabilitators who wanted to own and care for raptors; one was for a licensed rehabilitator in Winsted who wanted to care for a bat... Connecticut state law prohibits ownership of certain types of exotic animals without permits, including those in the bear and wolf families and large members of the cat family such as tigers and jaguars. "People who possess these animals generally do not request a permit, and that is one of the problems that underscores what we have to deal with," Parker said. Nope, not an easy job, because careless people are everywhere, and some of them think owning odd animals is a good idea. I agree Stamford Talks, I agree. STAMFORD -- Mayor Dan Malloy will hold "Mayor's Night Out" from 5 to 7 p.m. Tuesday at Starbucks, 1055 High Ridge Road. Residents are invited to discuss concerns, and will be seen first come, first served. The next "Mayor's Night In" will be 5 to 7 p.m. March 18. For information, call 977-4150. I thought that the newspaper editorial was tremendously NOT helpful to the situation in that it calls for the banning of ALL exotics. I don't think that is reasonable, nor do I think that will pass on any level. I don't think that you get to take away little Joey's turtle and aunt Ethel's canary without a long drawn out fight. As you know, I live up here right by where this atrocity happened, and I have a kid who is often outside. That Chimp was dragged all over town and this could have happened anywhere. There is no excuse for why the city didn't step in at least with spot checks and inspections of some kind after the downtown occurrence...It was a dangerous situation clearly and many of us had no idea that thwe thing was not kept in a serious caged situation. I do believe that no one should be allowed to keep chimps or primates outside of certified trainer or keeper, and/or zoo facilities. I covered this on my blog as well, and my friend was a first responder to this particular tragedy....but what I haven't had time to address is this editorial, which goes overboard in a knee jerk fashion that, if taken seriously, would surely endanger us all more in that it would stop anything reasonable from getting passed quickly. I don't know the editor over there, and I don't know why he/she felt it necessary to throw that out there when people are in danger, but thats what happened. Thankfully, that advice wasn't taken, but the editorial did get to people out there who may discard their non dangerous exotics in fear. I just wish that Stamford Talk couldn't be so easy to blindly agree with our local government. It could be said that the defunding of social services and public infrastructure has left Stamford with a wholly inadequate animal control/dept of health situation. Our dog catchers tend to be wonderful and will show up to get a baby bird thats fallen from its nest or a lost dog right away, but there is no push to license dogs or educate people about animals, wild or otherwise. One has to be very proactive to even get and answer on say a raccoon threatening...or where to test a tick. When I was a kid, the dog catchers in NYC, along with the post office I think, would drop a dog license form in with the mail slot, thus creating revenue and instructing people what to do. This was before pooper scooper laws and there was dog poo everywhere and unlicensed dogs roaming around Brooklyn. These are the sorts of functions that government used to have in society before the neocons decided to only grow government where it profited them and their friends. The rest was called "socialist" and it was implied that it should somehow be taken care of privately. When I moved here I was hard pressed to find any information in the government center about dog licensing or much else. Up here, where the animals are, we are the last area of response, what with all the downtown needs. I saw the dept of health respond aggressively for a noise complaint from my rooster from a crank who moved immediately and was not around for the court case; costing me and the city time and money. I wonder what would happen if our safety was as important as our comfort. Many people have moved into luxury homes up here and they have no idea at all how safe they are on so many levels. The real issue is not the illegal exotics that are definitely out there...I know for a fact about a couple (though I don't have addresses to figure out if I should report or what to do...)...but I do know that the same people playing in neighborhoods with dangerous animals are also facing a worse danger of an underfunded paralyzed fire department up here. That is the kind of social service that goes along with animal control, ambulance, and police that requires "spreading the wealth around" in a "socialist" way that some people mistakenly assume isn't a part of what America is about. We cant afford to just try not to think about these things because they are sad. We have had our social net pulled from under us, and this is just a symptom. we need to demand of the mayor-for-now (as if hes gonna rock any boats) not just a band aid animal reform, but the budget money to back it up...and while hes at it, lets fund the volunteer fire departments and find a sane way to allow the career volunteers to work alongside the union firefighters....and we could use more than one cop in North Stamford at a time, not to mention support for the ambulance service. Those 2 million dollar mansions mean little when they've burnt to the ground or some dangerous animal has torn your kid's face off.